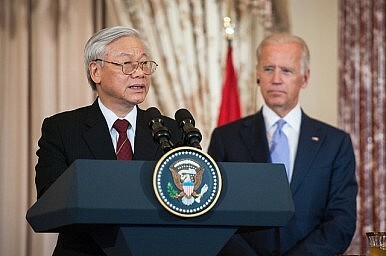 With some “diplomatic insight and political vision” the US could write a new future with Vietnam. Vietnam will start the new year with a bang. Next month, its Communist Party (CPV) will hold a momentous 12th National Congress and reshuffle its top three positions of party chief, president, and prime minister. In terms of foreign policy, their priority will be deciding whether to hew closer to the United States or China. Lately, China’s Pacific power grab has inspired a renaissance in U.S.-Vietnam relations. For the U.S., sustaining this welcome trend will require a more complete reconciliation over its tragic history with Vietnam. Recent progress in U.S.-Vietnam relations has been encouraging. A summer trip to the White House by Nguyen Phu Trong, head of the CPV, signaled how their economic and security interests are converging. Vietnam is already America’s largest trading partner in Southeast Asia; once ratified, the Trans-Pacific Partnership should further boost economic ties. In the South China Sea, Washington and Hanoi both cast a wary eye on Beijing’s Great Sandcastles. It is no coincidence that Washington has pledged closer maritime cooperation and temporarily lifted a ban on the sale of lethal weapons to Vietnam. Yet for all their shared interests, relations are not all they could be. In the U.S., human rights issues and the prospect of befriending a communist country are unresolved concerns, while some in the CPV still fret that Washington seeks a changing of the guard in Hanoi. Above all, the war legacy still haunts both sides. Converging geopolitical interests matter, but a more complete reconciliation over that great human tragedy is essential to realizing the full potential of U.S.-Vietnam relations. A responsible gesture is a reasonable request. During the war, the U.S. sprayed 11-12 million gallons of Agent Orange, a toxic herbicide, over southern Vietnam – an area the size of Massachusetts – to deny jungle cover to communist fighters. The results are still devastating. Due to exposure to Agent Orange, an estimated 3 million Vietnamese, including 150,000 children, have developed a laundry list of debilitating diseases and some of the most chilling birth defects imaginable. In many cases, these have been passed down through generations of families. That has made it hard to forgive and forget. America has not made the task any easier. On the one hand, it has set aside $13.4 billion to compensate 250,000 of its veterans for thirty-three illnesses and birth defects related to Agent Orange exposure. Presumably that is because it believes Agent Orange was harmful. And yet for Vietnamese victims – the actual targets of Agent Orange – it has cited a lack of medical evidence and legal liability to take similar measures. A more appropriate response would be along the lines of the Aspen Institute’s recommendation for a ten year, $450 million program, with $150 million given to clean remaining Agent Orange hotspots – an effort that is already underway at Da Nang airport – and $300 million to provide health-related services to Agent Orange victims. For the U.S., carrying forward such a comprehensive program would be a courageous, necessary, and strategic step towards reconciliation and closer relations with Vietnam. And now would be an opportune time to do it. Announced in advance of Vietnam’s upcoming party congress, such a commitment would build on recent momentum and give the deliberating Politburo reason to believe that Washington will be a more steadfast partner than Beijing. This could help orient Vietnam’s new leadership and foreign policy towards Washington, and vice versa, bolstering America’s Pacific pivot and alleviating Vietnam’s overdependence on China. One should not need a geopolitical argument to advance a compelling moral cause, but it does not hurt when the two converge. Human rights issues are not to be downplayed, but of all places, Washington should recognize the difficulty of transforming Vietnam to its own liking. Moreover, with a quarter of Vietnam’s population under the age of 15, nearly half online, and 16,500 studying in the U.S., the country’s dynamic youth – not Washington – will determine its future course. Addressing the legacy of Agent Orange would also be a strategic investment in goodwill with this cohort. The U.S. would be wise to align policy with its strategic interests in Asia and the future leaders of Vietnam. While commemorating the 20th anniversary of U.S.-Vietnam relations, John Kerry conceded that the war “stemmed from the most profound failure of diplomatic insight and political vision.” With a bit of both, the U.S. can right its wrongs and write a new future with Vietnam. Morally and strategically, that is the right way forward. Zach Przystup is the Assistant Director for Global Executive and Diplomatic Education at The Fletcher School at Tufts University, and a Non-resident Sasakawa Peace Foundation Fellow at Pacific Forum CSIS. Does Russia Fit Into the US-Vietnam Equation? Russia’s traditional ties to Vietnam may be of use to the White House.